If you're looking for a Samsung flagship with an enormous amount of storage and a relatively low price, then look no further than B&H Photo today. 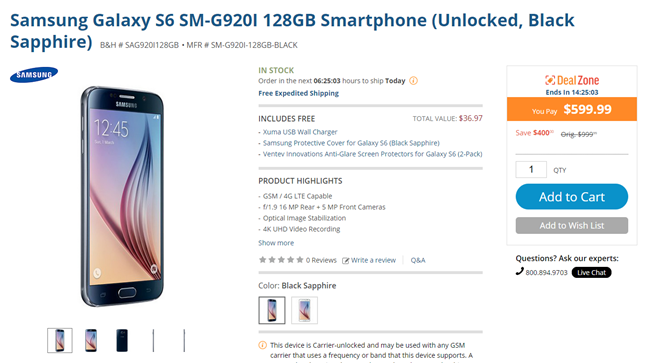 The online retailer is selling a GSM unlocked, off-contract version of the Galaxy S6 in the top-tier 128GB capacity for $599.99. This is a brand new phone in black or white, and the SM-G920I model includes LTE radio bands for AT&T, T-Mobile, and most of the GSM-based MVNOs in the United States. It's a hell of a deal - and it's only available today. At the moment the going rate for the 128GB model seems to be about $800, which means you're saving a cool 25% at this price. Carriers often bump that up (AT&T is selling its branded version for about $885) and the listing quotes a $1000 retail price. What, that's still not enough savings for you? How about free shipping, plus a Samsung protective cover, plus a pair of free screen protectors? That's got to tempt even the staunchest penny-pincher. B&H is a US-based store, so international shipping may not be available. The deal is valid until 10 PM Eastern Time today, but with a price this low stock may disappear quickly. Get an order in fast if you want one.